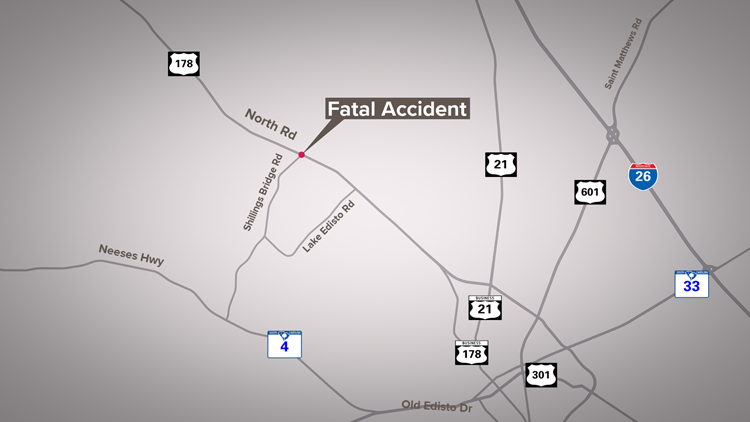 Troopers say the accident happened around 3 a.m. Saturday near the intersection of North Road and Shillings Bridge Road. ORANGEBURG COUNTY, S.C. — One person is dead after a vehicle overturned several times in Orangeburg County on Saturday. Trooper Tyler Tidwell with the S.C. Highway Patrol says the single-vehicle accident happened around 3 a.m. Saturday morning near the intersection of North Road and Shillings Bridge Road, approximately 3 miles west of Orangeburg. The driver of a 2002 Cadillac Escalade was traveling west on North Road when the car ran off the right side of the road, into an embankment and overturned several times, according to Tidwell. Troopers say the driver was transported to the Orangeburg Regional Medical Center and then to Prisma Richland Hospital, where the driver died on Sunday.